The houses, in their elevated setting, make an ideal location for relaxing and getting away from it all. The views from every angle are awe inspiring and breathtaking. Special Notes: There are cliffs nearby and children should be supervised at all times. We had a wonderful stay at Galley Head. It is a beautiful place and we were blessed with the weather. The views are spectacular and the lighthouse is majestic. If anyone wants to get away from the rat race this is the place to go. Thank you for taking the time to leave your great review. We're delighted to hear you thoroughly enjoyed your stay and hope you return to an Irish Landmark Trust property again soon. Thank you for taking the time to leave your review. We're delighted you enjoyed your stay in Galley Head and we hope to welcome you back to an Irish Landmark Trust property in the future. It exceeded expectations. Wild, warm, homely, comfortable, spacious. And the attendant keepers were friendly, informative and obviously cared a lot about the buildings. It was a great break away, thank you for such a sympathetic restoration and fir making these available. Thank you for taking the time to leave such a lovely review. Galley Head is a spectacular spot and we're so happy to hear you thoroughly enjoyed your stay there. The local House Manager's are always a wealth of knowledge and really do care for the properties. We do hope to welcome you back to stay with Irish Landmark Trust again soon. Gail, the manager of the property, was extremely helpful. She made the visit most enjoyable--providing information on local historical sites, restaurants, directions, etc. Thank you so very much for letting us know you had a lovely time at Galley Head Lightkeeper's House 1. It is wonderful to hear you were so well looked after during your stay. We're delighted to hear you enjoyed your stay in Galley Head. We think it's a very special place and we always like to hear that others think so too! Thank you so much for the wonderful review and we would love to welcome you again some time in the future. We were fortunate enough to find and book a stay at this marvelous landmark. A beautiful treasure to be sure. Delighted you had a great time at Galley Head Pat. It was lovely to have you stay at an Irish Landmark Trust property and have a true Landmark Experience. We do hope to perhaps welcome you to another of our 32 properties located all around the island of Ireland. A very unique and private spot to spend a holiday. The view is spectacular and the location allows for many options for day trips. Would highly recommend this cottage and will stay again if I'm ever back to Ireland. 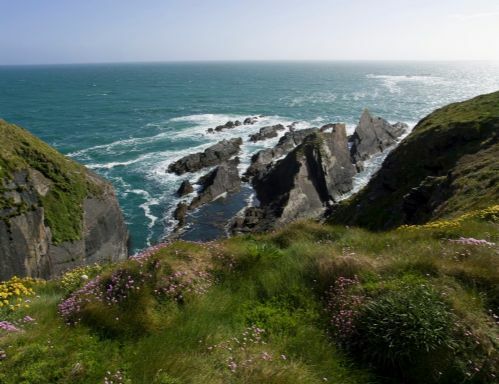 We're delighted to hear you enjoyed the beautiful location of Galley Head. It's a very special property in a stunning spot!! Thank you very much for the great review and would love to welcome you again should you return to our lovely Island. We had a great stay at Galley Head - two nights was not enough. The welcome was wonderful and the whole experince was a wonderful change from real life. The area was also excellent - lovely scenery and lots to do in town, country or at the beach. We'll be back. 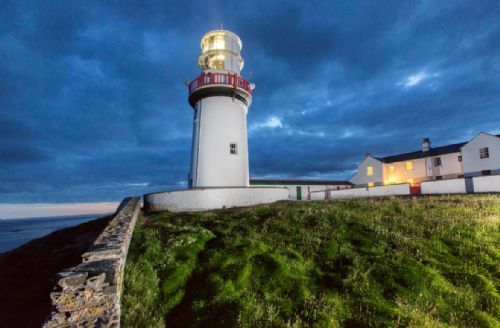 What fantastic news to hear that you had such a fabulous time at Galley Head Lightkeeper's House and you found the Irish Landmark experience to be positive change from the hustle and bustle of everyday life. We look very much forward to welcoming you back in the future. Always wanted to try a lighthouse stay in good weather - and that's what we got. Super weather really made the most of this amazing location. Tranquility like nowhere else while living in a well appointed house. Great support from Gail - and complemented by a lighthouse visit by the Attendant Keeper Gerald. Now would like to return in bad winter weather .. just to experience a different ocean. Great to hear that the sun shone and you got such lovely weather for your stay at Galley Head Lightkeeper's House 1. The wonderful thing about the lightkeeper's houses we offer as self-catering accommodation is whatever the weather they make for a great adventure and an experience of how exposed these properties and the families who lived in them, were to the elements. We look forward to welcoming you back for another landmark experience in the future. A perfect location to get away from it all on the edge of the world ! Only the sound of seabirds and the crashing waves below. Just wonderful. Delighted you found Galley Head so magical. Thank you for supporting Irish Landmark Trust. Una casa stupenda in un posto da fiaba, da rimanere senza parole per la bellezza e la particolarità del posto. La casa è pulitissima ed incantevole. Soggiornare nel faro racchiude in parte l'essenza dell'Irlanda. Da ripetere assolutamente. Grazie mille a voi. (I am afraid that is all my Italian!). Delighted that you had such a lovely and enchanting stay at one of the lightkeeper's houses in our care. It would be wonderful to welcome you back again and look forward to perhaps doing so in the future. The facilities and house very comfortable. Driveway has large potholes in danger of damaging a car!. Thank you for staying at Galley Head Lightkeeper's House. We are glad to hear you had a nice time. 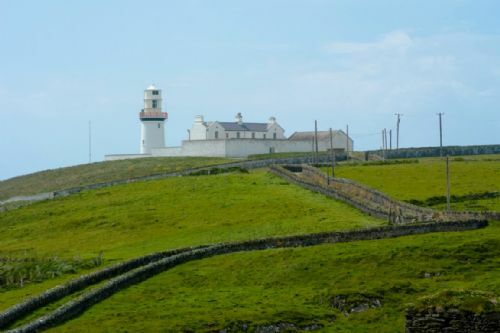 Unfortunately the road to the lighthouse is not Irish Landmark Trust's responsibility and even the local community also are effected by the road conditions which has been noted. Guests are always urged to take there time when traveling to some of our properties, given the isolated locations and the lack of funding for local councils to maintain certain roads. This is an issue throughout Ireland unfortunately. I highly recommend this property: great location with 360 stunning view, hospitality and clean and comfortable place made this place the best choice we could make. You are very kind to recommend Galley Head Lightkeeper's House 1 to other potential visitors. Thank you for supporting Irish Landmark Trust by staying at one of our self-catering properties. We stayed as a mother daughter pair for two nights at Galley Head. It was such a place of respite. We shopped at the SuperValu at Clonakilty and then, despite our plans to go out and see the countryside near us, found that Galley Head was so pleasant and restful that we didn't want to leave it. So we didn't! We took walks to some local beaches, and spent hours looking out over the waters watching whales blow water into the sky, basking sharks feed and gannets and gulls and other birds luxuriate on the water. The property itself was spotless, well decorated, and felt like a real home. The furniture was all in good order, with newer pieces blending with antique. The kitchen had anything a person could possibly need, including two ovens, a large fridge and a healthy number of plates, pans, cups, glasses and all silverware. The fireplace was a joy, and they provided peat and starter so we could enjoy the fire as well. The bathroom was huge, the shower worked well, and we had more than enough towels. It was nice that the house is secluded form other visitors with a double set of locked gates, so you really are all alone (with possibly next door guest neighbors). We loved this place and can't wait to go back. Wow! 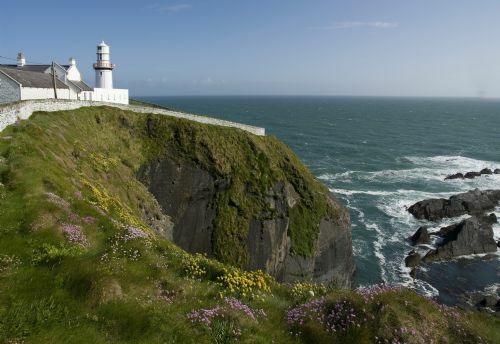 It sounds like you had a very special mother daughter getaway in Galley Head. To see so much in those two days and not have to go far at all is a true testament to the natural beauty of the Island of Ireland. We're delighted to hear that everything inside and outside the house was perfect and that you felt so at home there. You're very welcome to return soon and remember that when you stay with Irish Landmark Trust you're helping us save Ireland's built heritage! Had a wonderful relaxing stay. A great place to escape from it all. Also some of the most fantastic scenery. We will definitely plan another trip. Delighted to hear that you had such a wonderful stay at Galley Head Kightkeeper's House 1 and you had a chance to properly escape from the world during your time there. We do hope to welcome you back again in the future. Amazing Place - even better than I remembered 2nd time around! Unique, glorious isolation. Sitting by the fireplace with a glass of wine. Walking the property lines with the incredible views. Delighted you had such a lovely stay at Galley Head. Thank you supporting Irish Landmark Trust. We're delighted that you had such an enjoyable stay. Yes, all our properties are ghost free!! Thank you for the great review and you're welcome to come stay again in the future. A stay at the Galley Head Lightkeeper's house is not an ordinary holiday, but rather an immersion experience. The narrow and winding road to the light--which stands like a welcoming beacon--sets the mood for the rest of your stay. Gail Butler is a warm and wonderful host, flexible and generous with her time and knowledge. Certainly the house is not a luxury hotel experience, but rather an opportunity to imagine what it must have been like for those who lived there and kept the light burning. The kitchen is more than serviceable and the parlor comfortable. We had a peat fire in the evenings, enjoying drinks while watching the night fall, sky going pink and then dark, behind the lighthouse. Master bedroom had an incredible view. The bed is charming, but maybe a more back-friendly mattress could be considered. Plenty of hot water, although not a lot of water pressure, but bathroom large, plenty of towels and good light. Gail recommended lying on the lawn when the dark was full on, looking up at the stars and the light as it moved across the sky. An unforgettable thing to see. Plenty to do around the area, good walking along the cliffs, sightseeing if you like that. But just watching the light, the changes in the sea and sky is enough to make for a memorable few days. Do take plenty of provisions--nothing close by, so plan ahead. A truly unique experience. Wonderful to hear that you a full and true Irish Landmark experience at Galley Head. It truly is a magnificent place to stay in all weather but glad to hear you has some good weather so you could take Gail's advice about watching the stars from beneath the rotating beam of the lighthouse. It is a very special thing. It was a lovely experience to spend time in a special building full of history and character. The scenery of course is great but you are very isolated and far away from everything so it may not suit everyone. Wonderful to hear that you had a nice stay at Galley Head and that you enjoyed the scenery. Most of the lightkeeper's houses would be isolated due to their location on a peninsula head but many are not too far from nearby towns where guests can stock up for their stay. 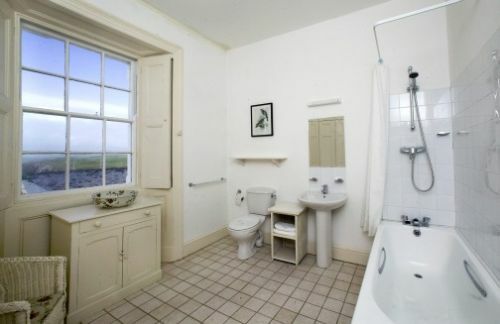 All of our properties listed on www.irishlandmark.com have a FAQ sections and a location sections where guests can see how far the nearest town is from any property. A wonderful holiday: the accommodation was excellent in every way. Our extended family took both lighthouses and we had perfect weather. Gerald and Gail Butler could not have been more helpful. Delighted you enjoyed your stay, thank you for taking the time to write this review, we are really delighted you enjoyed your stay, come back again soon. Booked the lightkeepers houses for a birthday getaway for family and some friends & will be patting myself on the back about this choice for some time. The houses are immaculate and surprisingly spacious -- combined with the absolutely stunning, remote location set against the sea and sky, it is the perfect place to clear the head and step away from everyday life. Adults and children alike were absolutely taken with it. Thank you for taking the time to write this review, we are really delighted you enjoyed your stay, come back again soon. Drove up to the lighthouse in thick fog and mist on the tiniest roads - only when standing right in front of it was the lighthouse and lightkeepers house finally revealed. Very atmospheric arrival and so cosy to go inside the house. Time specific furnishings give a sense of both the familiar and the strange at the same time - really a fantastic experience. Next morning - clear skies and views that go on forever in every direction. Beautiful walks and drives all over this area - would have loved to stay longer - 2 days was far too short! Wonderful to return to Galley Head - magical! We waited 10 years to come back. First time with 1 boy now with 3! Really delighted you came back to visit , thank you for your feedback, come back again soon. We had a magical family at Galley Head. House manager Gail gave us some great tips on suitable places to visit with small children. Thank you for your feedback, we love to hear what our guests think, would love to see you back in the near future. WE WERE STRUCK BY THE QUALITY OF FURNISHINGS AND KITCHENWARE.GAIL WAS EXTREMELY WELCOMING AND HELPFUL AND TAKES GREAT PRIDE IN HER FAMILY'S LIGHTHOUSE HERITAGE AND IN HER WORK. THE ONLY THING THAT DISAPPOINTED ME WAS THAT WE LOCKED THE GATES BEHIND US, THIS MAKES THE LIGHTHOUSE EXCLUSIVE AND NON- ACCESSIBLE TO LOCALS.AS INTEGRAL PART OF OUR COUNTRY'S HERITAGE? I BELIEVE THESE BUILDINGS BELONG TO THE NATION AND EVERYONE SHOULD BE ABLE TO SHARE IN OUR MARITIME PAST.I UNDERSTAND THAT SOME LIGHTHOUSE GUESTS MAY NOT WANT TOURISTS HANGING AROUND BUT WHAT ABOUT OPENING THE GATES FOR A FEW HOUYRS A DAY? AS I SAID, OUR STAY WAS EXCELLENT BUT THE EXCLUSIVITY IS THE ONE ASPECT THAT WOULD DISCOURAGE ME FROM STAYING THERE IN THE FUTURE AS IT GOES AGAINST MY PRINCIPLES. Thank you for taking the time to review your recent stay at Galley Head Lightkeeper's house. I can see from your review and marks out of 5 that your time at this property was overall excellant which is wonderful to see. Regarding your comments on the locked gate I am afraid this is not Irish Landmark Trust's gate. Galley Head lighthouse itself is a working lighthouse station. Therefore it is in the ownership and protection of the Commissioner of Irish Lights. Irish Lights are a maritime organisation that deliver an essential safety service around the coast of Ireland and support the marine industry and coastal communities. Unfortunately these days we do live in a society where people are always respectful of such a property and lighthouse sites must be protected from vandalism. Galley Head Lighthouse is an isolated property with no lightkeeper living on site. Therefore Irish Lights have erected a gate to ensure that only guests staying at the Irish Landmark properties or people who have permission from Irish Lights have access to the site. Enjoyed the Galley Head 1 so much! Views are amazing! Gerald and Alex were very friendly and helpful. 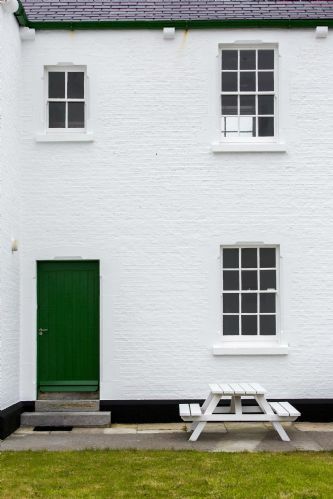 Their history of the lighthouse makes the place come alive Andrew looked at as a home. Gerald goes out of his way to accommodate all. We were so privileged to have taken a tour of the lighthouse. Only small item I could say needs attention isn't the water pressure in the ough pressure for the tub but not the shower. Thank you Gerald and Alex! Galley Head is an amazing, majestic place. The scenery, the house everything was amazing. The House is a perfect chill-out zone, great for us to catch up. We arrived Friday evening and didn't leave until Sunday lunchtime. The walks around the Lightkeepers house were great and helped to blow our hangovers off! Highlight was meeting Gerald, the Lighthouse Keeper, who gave us a tour of the Lighthouse on a dusky Saturday evening. A fantastic asset for the Landmark Trust. Gail was so helpful to us also, a great set up all around. A little gem. Thank you for taking the time to let Irish Landmark know how you enjoyed your recent stay. We are delighted that you had a nice time and do hope to perhaps welcome you back again to another of the properties Irish Landmark care for. This is a magical place to get away from it all. Gerard and Gail were so warmly hospitable and friendly, Highly recommended. We really loved everything about it especially the beautiful and tranquil setting. It's a very special place. You feel very connected to the natural world there and wonderfully disconnected from the stresses of modern living. Very disappointed with the condition of the house, not clean, no toaster, only one lamp between all of us, rubbish shower with just a trickle of water, no cushions on the very hard chairs. No firewood just for the first night, arriving at 4pm with tired children to a cold house. Front gate not on, it was just left propped against the wall, having a toddler with us we really needed it to close to keep him safe in the garden. Very limited cooking utensils, the whole place especially the exterior walls could do with a good paint. Overall a bit of a miserable place really, but wonderful views. Overpriced for the American market we think. Comfortable bed though. A pity we don't have more positive stuff to say. The location was stunning as expected and the remoteness was relaxing and rejuvenating. One or two more road signs and better directions may have helped us find our way but we found it eventually. We were coming from the west not thru Clonakilty. Thank you talking the time to write this review, we are really delighted you enjoyed your stay, come back again soon. Delighted you enjoyed your stay, it's always nice to hear what our guests think, come back again soon. The galley lighthouse one , is an excellent tranquil place to stay . Real peaceful and you get to see storm and still be safe within the confines . We had a great welcome from the manager Gail . The house is warm you can really experience the history of the place . My young son was so impressed wanted to book the two houses so the grand parents could stay next door . If s holiday were you want to experience all sort of weather this is the place . The only fault I would see is the road up has lots of potholes needs maintaining . And of course to look out at a lighthouse every night is a great experience . Thank you for your feedback, really delighted that you enjoyed your stay, would love to see you back in the near future. 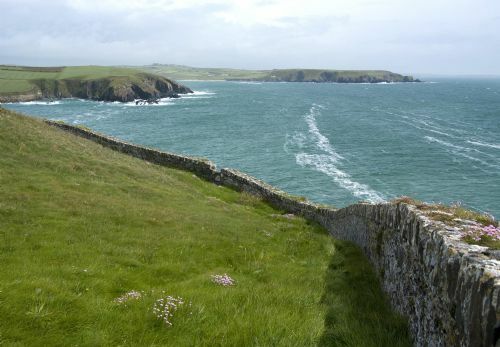 Fantastic location, breathtaking views, well protected by walls from impressive cliff's with waves breaking down below. We experienced it through a raging storm and a still starry night a few days later- majestic!Gail Butler who looks after the property is an enthusiastic bundle of energy and has an infectious enthusiasm and love for the place which was a great introduction. 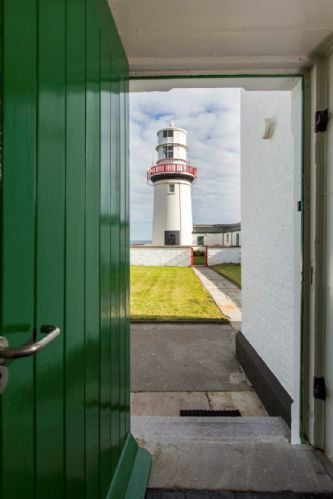 Thank you so very much for taking the time to let Irish Landmark Trust know how about your recent stay at Galley Head Lightkeeper's House 1. We are delighted that you had such a wonderful time. I do hope that we have another chance to welcome you back. Hello, we had a great time in Galley Head, we loved the house and the fact that we could see the lighthouse working in the evening, even from bed! - I missed a side lamp in the living room I could use as reading lamp (it is such a quiet place, conductive to reading), the only side lamp that is there is a beautiful lighthouse keepers lamp, but it cannot be used as a reading lamp. - I missed a visit to the lighthouse; we were told to keep an eye to somebody who might come to the lighthouse at some point, but we never saw him. Maybe if there was an option to request a visit with the booking? In any case, my family and I had a great time and might come back! So glad you enjoyed your stay, thank you for your review and suggestions , we can not take requests with the booking for visits to the lighthouse , would love to see you back perhaps at another Irish Landmark property. A beautiful scenic place to stay with wonderful views and lots to see and do nearby. Noisy neighbours staying in adjacent cottage but no complaints otherwise. Thank you for your feedback , so glad you enjoyed your stay, would love to see you back perhaps at another one of our properties in the future. If you would like to do something completely different during your tour of Ireland a stay at Galley Head is perfect for you. We stayed Sept.10-13, 2016. The weather was wonderful with a mix of sunshine and the experience of a gale one day with lots of wind and rain. We enjoyed every minute. The location was beyond beautiful. There are castle ruins within walking distance which completely sparked our curiosity. Walks along the cliffs were breathtaking. The accommodations were adequate and comfortable but if you are looking for luxury you won't find it here. The light keeper and his family do not live on the property but did visit us while we were there. We were given a tour of the lighthouse itself and told a bit of its history. They are very friendly and nice people. I would highly recommend a stay at Galley Head to complete your tour of Ireland. The memories will stay with us for our lifetime. Happy travels. Thank you for taking the time to write this review, really delighted you enjoyed your stay, it's always nice to hear what our guests think , come back again soon. This was so awesome. Totally recommend it. Standing under the lighthouse in the dark watching the lights and the stars, incredible. The second night it was storming and the sea foam was blowing everywhere. The wind was howling. Thank you for taking the time to write this email, so glad you enjoyed your stay, it's always nice to hear our guests comments, come back again soon. Loved our stay here - so dramatic and rugged. It's close to some lovely beaches and towns. Thanks so much! Would love to return some day. House was well kept and well equipped. Had a lovely farmhouse feel to it. This is a wonderful location and the accommodation was very comfortable (lovely and cosy) and well presented throughout. What really made a difference was the personal touch offered by Gail when we met to collect the keys and see the house. It really is lovely that the link to the Butler family is maintained in this way and we loved reading the family history and the history of the lighthouse itself. Gail was also great at explaining what was on offer locally by way of sightseeing, swimming and dining out. Anyone can stay at a hotel on holidays but this building is a unique part of our heritage and it was a privilege to feel part of it, if only for a short time. When you lock the gates behind you, you really feel that you have turned your back on the rest of the world and there is only you, the lighthouse and the sea (and a lovely open fire)! Delighted to hear you had a nice stay at Galley Head Lightkeeper's House and thank you for your kind words. We hope to perhaps welcome you to another Irish Landmark Trust property sometime in the future. The Light-keeper's House we stayed in was wonderful. It had a lovely blend of the old and the new - we knew we were in an authentic light-keeper's house but the facilities were modern. We thought we would miss the tv but didn't at all. We were there for three days but the furthest we travelled was as far as Clonakilty for shopping. We walked around the Light-keeper's house, we went to two local beaches and we spent time just looking out to sea and spotting seals but no whales. Gina who looked after us was friendly, chatty, open and very responsive when we had an issue with the heating. She held a wealth of knowledge on the House and its history. This is a great place to get away from it all and to be in the middle of magnificent natural beauty. thank you for taking the time to write this review, really delighted you enjoyed you stay, it's always great to hear what our guests think, would love to see back perhaps at another one of our properties. 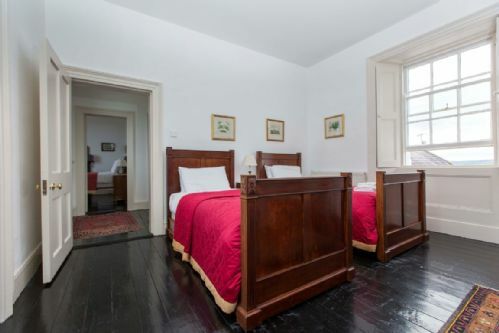 My husband and I stayed in the Lightkeepers House no 1 at Landmark Trust's Galley Head property in West Cork we experienced excellent weather and found it very exciting indeed to stay in this historic and romantic house. We were thrilled with the authenticity of the interior décor and most of all with the view of the Lighthouse itself. The beam sweeping through the night into the bedroom will long stay in our memories. On the last night there were needlepoints of rain highlit against the lighthouse beam -unforgettable. The Victorian shutters were in perfect working order for those that would find the light too bright. The books in the living room added to the atmosphere, and we enjoyed hugely lighting the open fire . We were very lucky with the lighthouse keeper Gerald Butler showing us around the magnificent lighthouse itself. We bought his excellent memoir and I am reading it now, keeping our favourite winter break very much alive. Gail Butler our concierge was most helpful and guided us to the best shops cafes etc. Only negative notes - the early departure time of 10 am - the kitchen chairs too low and the living room armchairs rather uncomfortable. Hope one day to experience the Wicklow Lighthouse experience. Unique and memorable visit ! I booked Galley Head lighthouse for 3 nights in Feb 2016 to mark a special birthday for my husband. There were four of us in total. We had a truly unique & memorable stay. The lighthouse itself is absolutely magical & the flashing light hypnotic!The location is spectacular with amazing panoramic views. We were incredibly lucky with the weather which really added to the whole experience. However I'd equally love to experience this location in a storm! Our host Gail and the lighthouse keeper Gerald & his partner Merie could not have been more obliging & helpful. We were lucky enough to get a private tour of the lighthouse during our stay. Gerald's knowledge was most impressive.Make sure to ask him for a copy of his book which is a really interesting read! The accommodation itself is rustic and comfortable though not luxurious by any means.The house was well heated all weekend.However the water pressure in the shower wasn't great .We booked a local taxi firm on two occasions to bring us into Clonakilty and back. There are plenty of really good restaurants to choose from in Clonakilty,which is about 10 km away. If you want to get away from it all and are looking for a really beautiful secluded location, then this is the place for you! We definitely hope to return! Thank you for the lovely review, so glad you enjoyed your stay, would love to see you back perhaps at another one of our properties. We had a wonderful stay at the lighthouse. It was really warm despite the storms and the views are magnificent. The fire lighting in the sitting room was very welcoming and Gail the house manager was very helpful. Would love to stay there again. Thank you for your feedback, really delighted you enjoyed your stay, it's always a pleasure to let guests enjoy our properties, we would love to have you back in the future. If you love lighthouses, Gerald Butler will not disappoint you. We were able to tour the light in daylight and at night, and take in as much lighthouse information of the area as time permits. And it was great just to be at home there…We had a group of 8, so we lived in both houses and shared the biggest kitchen. Thank you for your great feedback, so glad you enjoyed your stay at the Galley Lighthouse, would love you to come back in the near future. We are regular guests of Gallley Head and love the location. Gail the house manager is very welcoming and excellent. Our complaint is the living room has a couch that is not suitable to use any more and needs to be thrown out - hence we spent the entire weekend sitting in the kitchen also the carpet is totally rotten this also needs replacing. The kitchen could also use an update on utensils and a toaster! We would not be returning to this particular house with the condition of the living room. This made our weekend stay less enjoyable than before. Thank you for review of your stay. As you know Irish Landmark Trust is a non-profit charity and we have 26 unique properties that require constant maintenance. We have to budget for each one and replace furniture and other items when we have the funds to do so. I am glad to inform you that there is a budget in place for Galley Head so we hope to be able to get that in motion. Donations, including furniture that is in good condition, are always welcome. The perfect place to experience a storm! We stayed at Galley Head during Storm Barney and were cosily tucked up inside while the storm raged outside - it was great! We had to cut our stay short as there was a problem with the water supply - an Irish Water problem NOT a Galley Head/ Landmark Trust problem. The local property manager and the staff in Landmark Trust were super in terms of trying to rectify the problem and, when that wasn't possible facilitating our relocation. It is remote but that's its appeal and Clon is only 15 minutes away. 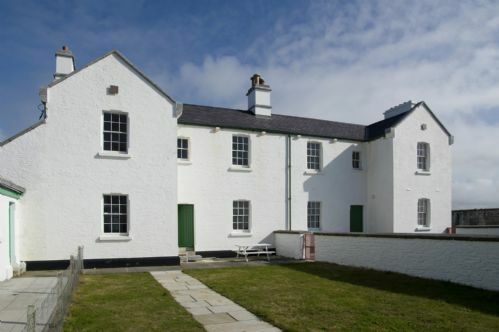 We will definitely be back to Galley Head and hope to stay in other Landmark Trust properties too. We had a really nice time at the Galley House lighthouse. Due to us getting caught in bad traffic leaving dublin we didn't reach the lighthouse until after 9pm. The host was very understanding about this and still took the time to show us around. The Fire was ready to be lit and the house was warm. Supplies in the cupboard were in short supply, we were very thankful that one of our wine bottles was a screw top. it also took us a while before we found some tea towels. Apart from that it was amazing to be able to spend a weekend in the presence of the lighthouse. I guess you could call it a childhood dream for both of us lived out in real life. I just wish it could have been longer. I would like to return someday and would like to stay for a few days longer but the one thing that would prohibit us from doing so is the cost of staying, we understand that the cost is well spent but for us to consider it as a viable option for a week long holiday the cost would be quite prohibitive. Again its not something that will stain the memory of what was an incredible weekend. Thank you for taking the time to write this review, it's always nice to hear what our guests think, really would love to see you back in the near future. A privilege to experience living as the lightkeepers would have with more mod cons of course! Loved staying here, house & scenery were unique, the family story & history of the keepers made it very personal. The diverse weather added to the magic, we had rain & gales on the first day followed by blue sky's and 17 degrees and the most amazing scenery. All our friends are jealous! Thank you for this review and great feedback, so glad you enjoyed your stay with us, be great to see you back in the near future. A dream became reality with our stay at the Galley Head Lightkeeper's House during our journey through the southwest of Ireland. And it exceeded our dreams ! A unique place at a unique spot with a marvelous history to tell - we immediately felt in love. Starting at the gate with a friendly welcome from Gail and then the last meters you drive on the small path between the white dry wall and then you stop just in front of the lighthouse. The house is a beauty and the big kitchen with the wood table a dream. There is not a lot of luxury to expect but furnished with style. Then you have to wait till it get's dark and the mystic and magic of the light starts - combined with the cozy peat fire ... in a real isolated spot ... just fabulous. With some luck you get that chance for a visit of the lighthouse guided by the last active lighthouse keeper of Ireland - just not to be topped. Thank you for taking the time to write this review, delighted to hear such great feedback, so glad you enjoyed your visit to Galley Head, come back again soon. 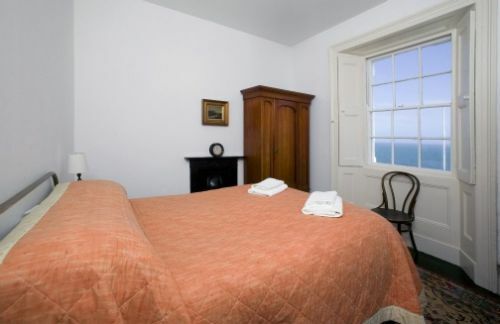 Our stay was relaxing and we enjoyed the beautiful coastline from our double aspect room. It was great to meet Gail who had all the history of the lighthouse as she is married to the youngest of the Butler family who were all born there. The surrounding areas were lovely to explore. Beach walks, pub lunches, we couldn't ask for anything better. Despite the position of the light keepers house we were very cosy with the open fire and central heating. Galley Head Lighthouse is something very special. We will be back. Thank you for taking the time to write this review, thank you for the great comments, look forward to your return. household were so serene. To show up to a fire in the fireplace began our arrival of such warmth and welcome. Not only was the home clean but also quite "homey", with a nice selection of books, too. So glad you enjoyed your stay, thank you for taking the time to write this review, it's always a pleasure to let guests enjoy our properties. After driving for 3 weeks the 2500 km of the Wild Atlantic Way, we were a bit exhausted and enjoyed to stay at the quiet and peaceful place at Galley Head. Also the weather was nice, so we could sit outside, look over the sea, read a book and just relax. Thank you again for the very lovely service of Gail Butler which made everything so easy. Thank you for taking the time to write this review, really delighted you enjoyed your stay, it's always a pleasure to let guests enjoy our properties. The views and location are totally amazing, and so too the passion of the House Managers. The Irish weather is not unknown for throwing tantrums, but there is no day (or night) in Ireland where Galley Head isn't spectacular. If you want to spend a lot of time sitting out on the wall looking out to sea and listening to the surf, bring a decent jacket, but aside from that, Galley Head has everything. Although the location was perfected by nature eons ago, the addition of a lighthouse made the place even better! The care and dedication of the Butler family to both the property, and to guests also is fantastic. Thank you for taking the time to write this review, really delighted you enjoyed your time at Galley Head, would love to see you back perhaps at another one of our properties. We really enjoy the 2 days in Galley Head, that's a wonderful place, thank you very much ! All the history of the lighthouse stays there, that's a pleasure to learn about it ! Delighted you enjoyed your stay, thank you for the feedback, its always a pleasure to let guests enjoy our properties. There's honestly no place like it. The view is like nothing else in Ireland. The facilities are perfect and the owner was so nice to deal with. It's s bit away from the town so you need to be prepared. It's expensive but worth it. Delighted you enjoyed your stay thank you for your feedback, come back again soon. Fabulous views in a really great location. The house has that old world feel with modern conveniences. The best bit for us was the lighthouse at night - looking at the beams of light over the sea. There are no distractions (telly/wifi) so if you want to get away from it all this is the place to go. The only downside was the bed - which was too small for the two of us! Gail was a great host and provided up with loads of local knowledge - places to eat and visit. Thank you for your kind review of your recent stay at Galley Head. I am delighted to read that you enjoyed the Landmark Experiance and we hope to welcome you back again in the future to another of our properties. A stunning location with fabulous views, a unique experience and a retreat from the world! The house is a well maintained, clean and simple property at the top of Galley head overlooking the Atlantic and a lighthouse at the end of the garden. Marvellous for that special break away and good for body, mind and soul to absorb the beautiful seascape. Gail( house manager) was very accommodating & helpful. Will definitely return. The only reason I marked down the condition to 'OK' was the that the driveway of the property was ina poor state of disrepair; and I don't think that it would take much to remedy this issue. Otherwiser a fantastic property in an excellent location. Thank you for taking the time to review your recent stay at Galley Head Lightkeeper's House 1. 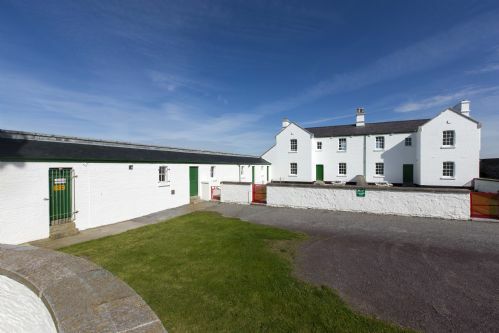 As Galley Head Lightkeeper's Houses are located on a working lighthouse station, Irish Landmark Trust unfortunately is not responsible for the driveway to this station. We look after the properties only. However, I am glad to hear that you enjoyed your stay at Galley Head Lightkeeper's House 1. Amazing location and facility, but a new sofa is desperately needed, and the shower is very poor -- especially for the price paid. Upgrade a bit and I'd have no complaints. Thank you for your review and suggestion, glad you enjoyed your stay, would love to see you back. The view alone would be enough to recommend staying at this property. It is spectacular. You can really experience the wildness and changing moods of the ocean. What a source of comfort the light must have been to sailors in earlier centuries. Add to this the story of the last lighthouse keepers, how they lived and what hardships they must have endured, and you have quite an informative and interesting experience. The accommodation has enough modern facilities to make it comfortable, but retains enough of the old to allow and understanding of how people lived in earlier centuries. Thank you for your review , it's always nice to hear such positive feedback, would love to see you come back in the future. 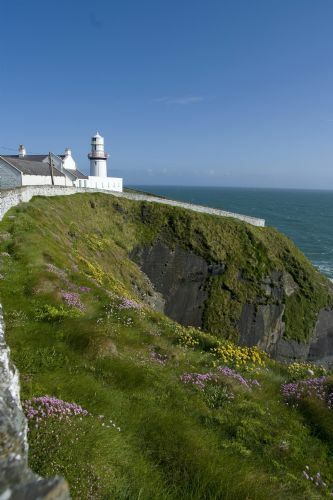 The Lighthouse is a property of the Irish Landmark Trust (ILT). We booked it through their website with no difficulties. The text says that there is a minimum 3 night stay but I put in for 2 nights and it was accepted. The text also says that they are very strict about the number of people in the party. We were 4 adults and a child. Each unit is denoted as sleeping 4 and the ILT office in Dublin insisted that we couldn't have a 5th person even if a child. That turned out for the best anyway as by renting both units we had the entire facility to ourselves. I can't imagine sharing that experience with strangers. The e-mailed documentation from the ILT was comprehensive and accurate. Payment is via credit card over the web in advance. There are separate managers for each unit. You are required to contact the respective manager 4 days before arrival to arrange for checkin. e-mail and phone numbers were provided. I e-mailed them and both promptly responded. Both had the surname of Butler but the contact information was different. When I heard back from them, Ger Butler, the manager for Unit 2, responded that he would handle the checkin for both units and to just call him when we arrived in Clonakilty. We were 15 minutes later than we expected but he was there to welcome us. It turns out that the other manager is Ger's sister-in-law so combining the checkin was no problem. Ger just lives about 5 minutes away. My son-in-law's family is from Galley Head not 2 miles from the lighthouse so Ger was familiar with the family. As Ger said, we had "connections." We spent 30 minutes visiting with Ger and his partner Marie after we arrived. Ger has a special connection to the lighthouse. His father was the lightkeeper and Ger and his 14 siblings grew up there! He said that as they slept 4 to the bed, cold was never a problem. I asked him which room had been his and he said he had slept everywhere. At that time the structure was divided into several areas. The westernmost room is now the kitchen for Unit 2. Previously it was an oil room. The breakfast table in this kitchen has the best view in the houses. The 2 units were separated and the principal lightkeeper lived in what is now Unit 2 and the assistant lived in Unit 1. When Ger's father was promoted, they had to move from Unit 1 to Unit 2. Eventually with automation there was only one lightkeeper and there was a door cut between the units and his family had access to both units. There is an enclosed corridor from the houses to the lighthouse. Today it has the electronics for the cellular towers. When we asked Ger what it had been used for previously he said that it provided a protected walkway from the houses to the lighthouse for safety in the winter winds. He showed us the worn marks on the stair posts where they wedged a board to keep the door from being blown open by the winter winds. He ought to write a book. Each unit has 2 bedrooms, one with a double bed and the other with 2 twins. Each unit has a large den and a large kitchen. 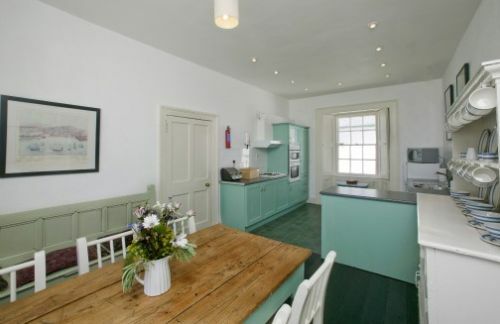 Unit 1's kitchen is slightly bigger and has a larger breakfast table. Both have complete appliances including oven, stove, small refrigerator/freezer, dishwasher, microwave, cooking utensils and china and flatware. Ger said there was a washer and dryer in a house outside but we didn't use these. The feeling of the interior is like a newly refinished farm house filled with antique furniture and games for the whole family. The floors are wide boards and freshly painted. I had read on the Internet other visitors' stories about having to learn how to operate the heating. During our visit the heating was by radiator and programmed automatically. We never had to operate or change the heating. Don't worry about the light from the lighthouse keeping you awake. There are heavy solid shutters on every window. But the beam of light is substantially above the house so the light is not a problem. I had also read that there was no cellular service at the lighthouse. That demonstrates the construction of the structure. There are numerous cell towers nearby including several ON the lighthouse proper. The problem with cellular service is that the outside walls of the structure are 30" thick effectively blocking the cellular signals when inside. Even if you stand at a window you need to try several windows to get one that has exposure to the cellular carrier you need to use. Standing by the window in the bathroom on the north side of Unit 1 I only got EDGE signal and actually couldn't make a phone call. I walked out of the bathroom and stood by the window at the top of the stairs facing south towards the lighthouse and got HSPA+. Similarly the inside walls block Wi-Fi signal. I had rented a Vodafone hotspot from Hertz. Even when I placed it near a window where it could see the appropriate cellular tower the Wi-Fi signal wouldn't penetrate the house. It was in Unit 2's foyer and I couldn't see it from Unit 1's bedroom. Remember that the units are "self catering" and come prepared. Assume that you need to bring everything. We rented both units and found 1 hair dryer in Unit 2. We went into Clonakilty and grocery shopped. Ross Carberry is about the same distance. Beware that the roads are NARROW. On the road up to the lighthouse ignore the "Private Property" sign. There are 2 locked gates that the keys to the units will open. Be sure to lock them behind you to keep out the sightseers. Even with them locked we had a group of tourists walk up. They weren't any trouble and I didn't blame them for seeking that view. The drive into either Clonakilty or Ross Carberry is about 10 miles of mostly one lane roads. The last mile into the lighthouse is full of potholes. I found a GPS indispensable although it generated different routes going into Clonakilty as opposed to coming from Clonakilty to the lighthouse. Be sure and let Ger share his incredible knowledge about the history and operation of the Galley Head lighthouse and the other lighthouses in the area. That won't take much prodding. Ger himself worked for the Commission of Irish Lights for 21 years. I had seen information on the Internet that said that the Galley Head lighthouse was going to be turned off. Ger said that that wasn't true. At some point in the future it will be converted to an LED light source. This will greatly simplify the operation as the LEDs won't have to rotate, just blink. When I asked him when this would happen he said that it would happen when he ran out of bulbs! He said he had 6 spares now. He said that due to the fees from the cellular towers that the lighthouse is actually a money maker. The light on Galley Head blinks 5 times every 20 seconds. It is painted white with a black ring just under the lights. This is the signature of the Galley Head lighthouse. The black ring was added some years ago to hide the discoloration running down from the catwalk around the lights. When this was done the Commission of Irish Lights had to notify all seamen. Red Strand beach is about 2 miles away and was good for an afternoon of splashing. At the end of May it was too cold to get in the water. We had pizza in Richey's in Clonakilty as recommended by Marie. We had lunch in the Celtic Ross Hotel in Ross Carberry. We had dinner in O'Donovan's Hotel in Clonakilty. The dining room hadn't opened for the summer so we ate in the bar. Don't confuse O'Donovan's Hotel in Clonakilty with O'Donovan's Fisher Cross bar near the lighthouse. Dennis O'Donovan doesn't serve pub grub in his bar but his Guinnesses are wonderful. The house is surrounded by a cliff wall that varies in height from 4-6 ft. with flowers growing in the cracks. Beyond this wall is an amazing view of the northern Atlantic. The grass is green. The rocks are black. The sea is blue. The sea gulls are white. Incredible! Dolphins, whales and seals are reportedly often seen in the waters but we didn't see any. Within easy walking distance are pastures of sheep and ancient ruins. A perfect place for "exploring" as my granddaughter calls it. This is a place to escape from the real world. On our first visit to Ireland we just visited Galley Head. On this trip we stayed there for 2 nights. On our next trip to Ireland this will be our destination spot. We just need to plan it for while Ger Butler is still managing it. Thank you so much for taking the time to write this review and for all the great feedback , it's always a pleasure to let guests enjoy our properties , delighted to hear you liked chatting to Gerard and hearing all about the Lighthouse, would love you to come back and stay with us in the future. Though the location of the property is spectacular and isolated ,we found that walking routes were very limited unless you drive at least 5 kilometres. There was no immediate access to the sea as private property notices blocked it. There was little indication on web site that the two houses have significant differences, one house offering more space and wonderful views from the kitchen.. If booking again I would like to know which house we are in. I would suggest upgrading the shower in the bath as water pressure is very poor or preferably installing a stand alone unit, there is loads of room in the bathroom for it. The double bed upstairs is comfortable but very small. A tour of the lighthouse would be a nice touch. Is there a need for two sets of gates? (we where blessed with the weather but what if it was lashing rain??) Could they be automated? The locks on the gates need replacement as they are very stiff. Thank you for taking the time to let us know how your stay at Galley Head Lightkeepers House 1 was. I would like to take a moment to address some of your comments. Regarding water pressure at the property although it is not super strong force due to the location of the property out on a headland, the strength is usually good. I will check to see if there was perhaps a loss of water pressure during your stay and follow up on that for you. You mentioned the 2 sets of gates leading up to the Lighthouse, yes these are necessary I am afraid. As Galley Head Lightkeeper's House 1 and 2 are located on a working lighthouse station access to these locations must be controlled. In order to ensure the security of these stations gates need to be erected. The salty air can mean the locks do get a little stiff but these are maintained on a regular basis to ensure guests can come and go freely during their stay. I will follow up and see perhaps if we can change the locks on the gates. We stayed for 2 nights in March and hoped for good weather. We were lucky and the views were magical, the lighthouse is a wonderful location. The rooms were comfortable, clean and homely. There was an issue with the heating which was sorted out quickly. So glad you enjoyed your stay ay Galley , thank you for the lovely feedback, would love to see you back. Yet another amazing Irish Landmark Trust property! Even on our approach to this property we were blown away. It is truly unique and very special. The introduction by the house manager was great as were learned about the history of the family and we were very very lucky to have a tour of the actual lighthouse with Gerald Butler! Made our stay! Really felt like home for 3 days. (wish it was! ;) The location is great too, with lots to do around. We will definitely be back to stay here again for longer next time. Thank you for the great feedback, so glad to hear you enjoyed your stay, look forward to your return in the near future. Thank you really much for this special experience. Everything was perfect. We loved the location and accomodation. The house is well equipped and furnished with a lot of love. Gail is a great host. We had a most enjoyable weekend. What a superb location with unsurpassed views. We will definitely stay again sometime. Many thanks to Gerard and Gail. Galley Head was terrific in every way. The house was cozy and comfortable, the sea was alive, and the lighthouse was extraordinary. The countryside is beautiful and we had several great day trips to surrounding towns and communities. A special thanks to Gail, who waited for us as we arrived late, and to Alex, who shared with us a personal insight into his mom and dad. We want to come back! Thank you for this review, it's always great to hear such positive feedback, looking forward to your return. Gail and Gerald were terrific! And our stay did not disappoint. I can't think of a better place to "fall off the world". We will be back. Delighted you enjoyed your stay, thank you for the great feedback, look forward to your return. The Best Place in Ireland! Galley Head Lighthouse is my favourite holiday stay in Ireland. The lovely Gail makes this so special for me and my friends with her warm smile and lightness of touch! I could run on and on with superlatives about the Galley. Every sense is heightened by the sound of the sea, the beam of the lighthouse and the peacefullness of the landscape. 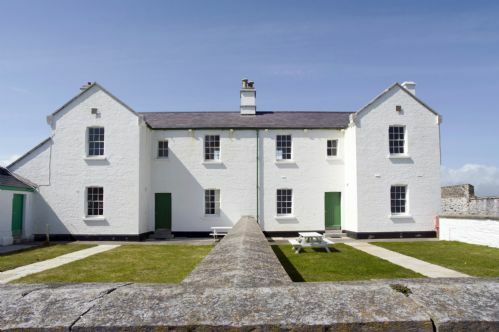 Thank you Irish Landmark Trust - you never let me down plus you make me very popular with my friends and family when I take them to an ILT property, especially this one! We have been going to Galley Head now for 8 years and we absolutely love it. The location is amazing and the houses are lovely, Gail and Gerard (the owners) are great and extremely helpful.I would recommend it to anyone. We had a wonderful stay in Galley Head. After a hectic year it was great to step back into peace and tranquillity. With amazing views the kids didn't even miss the Wifi! Remember to bring lots of books and take at least one visit to beautiful Clonakilty. Sleeping with the shutters open was great to watch the changing of colours on the wall, due to the reflected light of the Lighthouse. We would definitely recommend a stay in the cottage. Thank you for the lovely comments, it's always a pleasure to let guests enjoy our properties, would love to see you back again soon. We didn't leave the property for the entire weekend. We stayed sitting by the fire and enjoyed watching the storm sea outside! The house is very comfortable and warm balancing tradition with modernity. All in all we had a very enjoyable stay and took loads of nice pictures to remember it by. Gail was very friendly and gave us some history on the lighthouse. Thank you for the lovely feedback,delighted you enjoyed your stay. Our weekend in Galley head. The Galley head lighthouse and houses are very special. It gives you the opportunity to experience staying in a very special location. The accommodation was warm and clean and very tastefully furnished. I love the surrounding area as there is so much to do and coming back to the lighthouse was magical. Our stay at Galley Head was the highlight of our recent visit to Ireland. It is a spectacular setting and very peaceful. We appreciated learning about the Lighthouse from our hostess and knowing that the Butler family continues to be involved in its care. The accommodations were large and comfortable. The views from the house were wonderful, especially at sunset. We hope to return. Thank you for this review,delighted you enjoyed your stay,look forward to your return in the near future. From start to finish our whole stay here was amazing. The house is so well kept, the views spectacular. We all just felt do at home here. Gerald, the lightkeeper was very informative and only too happy to answer all our questions. Stay here and you won't be sorry. Thank you for the lovely review,delighted you enjoyed your stay. Perfect organisation (description of the route, phone numbers...) and nice contact before we arrived. We got a very warm welcome, all our questions were answered and we even were shown the lighthouse. Perfect location to spend some quiet, relaxed days, very comfortable and cosy. The views from the rooms are stunning, as is the whole location. We will recommend Galley head to our friends and family. Spectacular views. Cosy comfortable cottage. Clonakilty is a lovely town. The views are spectacular. The house was very warm ,cosy and comfortable with an old world charm but with all modern conveniences. The Butlers who showed us around were very helpful and informative. We had excellent meals in An Sugan in Clonakilty and Deasys in Ring. We had lovely walks on deserted beaches and visited Bantry House. All in all a very relaxing enjoyable experience. Delighted you enjoyed your stay,thank you for the lovely comments,would love you to return. Welcomed by Gail who showed us around, provided info and key, and came to see us off when we left. Also met Gerald, the light keeper, who took time out of his day to talk with us and give us a guided tour of the lighthouse. An truly amazing experience all round. My husband and i spent 2 nights here just after getting married and all the craziness of family. We didn't leave at all except to go for the odd walk. What a beautiful peaceful retreat, perfect place to watch a perfect sunset!! First, the negative: you will wish you had booked for at least twice as long. Now the positive: the property is beautiful, the kitchen excellently equipped and a pleasure to use, the beds comfortable, the bathroom enormous and sunny. The view is amazing. Highly recommended. So happy to hear that you had a wonderful stay and thank you for such a lovely review. Please do try to come back and stay at another Irish Landmark property in the future. We would love for you to expire another property. The lightkeeper's house is situated on top of a cliff, overlooking the sea, in a quiet and peaceful area, which is not open to the public. Wonderful view from the bedroom; very friedly and helpful housekeeper. Thank you for reviewing Galley Head Lightkeepers House 1. Glad to hear you enjoyed your stay and the views from the bedroom. We look forward hearing from you again if you decide to stay in another Irish Landmark properties. Perfect. One of the best places we've ever stayed. Period. Staying at the Galley Head Lightkeeper's House was a gift. The photos don't do this exquisite property justice. They can't. The sea, the fields, the crashing surf below, the beautiful and well-appointed house--all are too beautiful to be accurately described in words or to be captured in a photograph. Our extended family took over both sides of the house, Galley Head 1 and Galley Head 2, which, together, would have very comfortably slept eight people. Each side of the house, connected through a door in the living room, would serve as the ideal place for a family of four to stay. 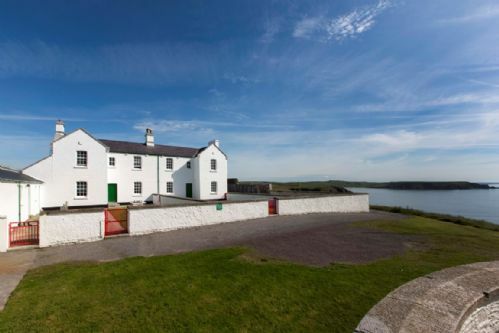 The property, which served as a perfect launching point for day trips around Cork County and the eastern part of Kerry County, was a terrific place to both begin and end the day. Our hosts, who know the property and area well, were kind, gracious, and welcoming. Both the place and the people made this a visit we'll never forget. Thank you for this lovely review and great comments, would love to see you back in the near future. It was like being in heaven, loved our stay. I thought check out time was a little early and they arrived 15 minutes early so I felt I couldn't have my breakfast in the sunny garden as was rushed to leave. Other than that Gail was very helpful with advice before and in arrival. John and I spent our 24th wedding anniversary here at Galley Head Lighthouse. I can only describe the experience as magical. On Saturday night we sat outside, beneath the lighthouse under a full moon, it was beautiful. Watching the beams from the lighthouse radiating for miles to see. I can still hear the whoosh of the prism spinning round and round, it was almost like a breath. I cannot recommend this experience highly enough. The hospitality of Gail Butler and the wonderful stories of life working on the lights from Gerard Butler make the experience more magical. As my husband aptly described, it was one for the bucket list! We will never forget this experience and can only hope to return again. Thank you so much for such a lovely review John and Theresa. We are all delighted that you had such a wonderful experiance at Gally Head. We had a marvelous time at Galley Head. The house and facilities are great particularly the open fire. It is lovely and peaceful and quiet. A great place to get away from it all and re-charge the batteries. We took a long walk to Long Strand and back through a combination of cliff walk, paths and roads all with beautiful scenery. We also took a car trip to Mizen Head where the scenery around the signal station is fantastic. Well worth a visit. Thank you for this great feedback,delighted you enjoyed your stay. Hope you return soon. Our stay at Galley Head Lighthoue was truly wonderful. Its setting and accommodations exceed all your expectations. We were greeted by Gail who's friendliness and knowledge set the tone for our visit as she gave us a history of the lighthouse keepers. The views of land and sea are magnificent. At night the lighthouse which fills each window and front door sends beams of light far out to sea and you get a overriding sense of its security and protection. As I laid in bed wanting to watch the beams of light as they rotated, the magic of the lighthouse lulled me to sleep within minutes. Each night I tried and each night I lost. 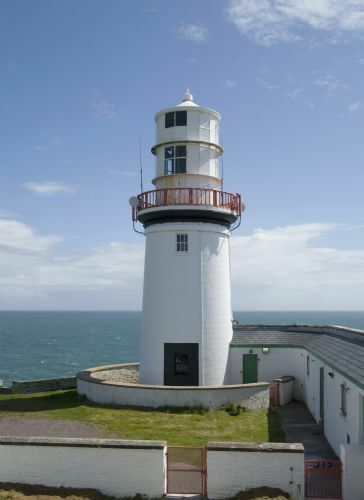 The remote lighthouse is ideally situated for touring the southern region of Cork and Kerry. The coast is dotted with secluded beaches and has beautiful rugged bays to explore. There is much to see and do and we only scratched the surface in our four day visit. 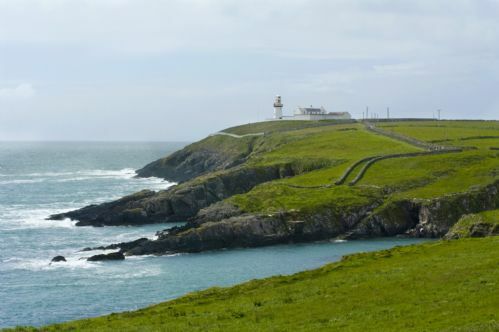 We were awed by Mizen Head, the most southerly tip of Ireland, and completely impressed with the famous Blarney Castle and the views of the parkland from its battlements. We travelled to Cobh and visited St Colman's cathedral which is beyond belief in beauty. The town of Kinsale was as pretty as written about. We also visited the Drombeg stone circle and sat and imagined the past. Galley Head offered us the perfect setting for viewing this historic, scenic, beautiful, fiendly, and magical region of Ireland. Thank you to The Irish Trust and Gail for for our perfect but all too short stay. Thank you for this review, we love to let guests enjoy our properties. Hope you return in the near future. Thank you for this review, delighted you and the kids enjoyed your stay. Look forward to your return. We spent a weekend at Galley Head. Gail was very helpful and the house was in great condition. I am looking forward to returning at the soonest opportunity. Delighted your stay was a great experience, hope to see you back soon. Love the photo thank you. A wonderful location and setting. Gail was extremely helpful and informative. A gale blowing on the Sunday night made it difficult to sleep but all the more aware of why lighthouses were built and manned in the first place. In comparison to other Landmark properties I've stayed in the kitchen was rather poorly equipped i.e. only one wine glass and we struggled a little cooking dinner the first night as the rings on the oven were pretty ineffective. However, who can complain when you literally went from sunshine to rain to cloud to rainbows in the space of 20 minutes. Irish weather at its best! I really loved my visit to Galley Head. What stood out was the kindness, friendliness and helpfulness of Gail Butler the house manager and Gerald Butler the lighthouse keeper. Gail was so helpful with information on local places to eat and also visit (all of which were just as good she had described ). Gerald gave us really interesting information on the lighthouse and it's history which we enjoyed immensely. The highlight was a visit to the lighthouse. What also blew me away was the sheer beauty of the area both around the lighthouse and around the area. We have all traveled over the years to many places but the beauty of the area surpassed anything we have seen anywhere. We genuinely hope to go back again and perhaps spend a little longer in the area the next time. I will recommend a visit to all my friends and family. A beautiful, peaceful place, managed by Gail and Gerald who are both lovely, friendly and knowledgable hosts. The lighthouse at night is really magical. Thank you for the feedback,delighted you enjoyed your stay. Hope to see you back soon. This was my second time at Galley Head. The spot is magnificent. Perched on a high cliff on a spit of land jutting into the sea, when you awake in the morning and look out your bedroom window, you might easily think you are sailing the seas. Both cottages are clean and comfortable (the other one is slightly bigger). You can enjoy your evenings in front of a turf fire. There is no tv, no internet, and no phone reception, so a stay at Galley Head is definitely a (welcome) exercise in getting away. Bring your books, your music, and your walking shoes. The Irish Landmark Trust folks are warm and helpful, and Gail Butler, the person who meets you on site, is a lovely, charming person. Go to bed at night with the Galley Head beacon lighting up the sky (5 flashes every 20 seconds) and drift off to a great sleep. The lighthouse is above the cliffs, there is a panorama view to a spectacular landscape and between wind and waves there is a cosy atmosphere inside the rooms. We enjoyed our stay because this is really a place to relax and calm down. Having stayed in a number of the landmark properties before, my expectations were high. We even considered cancelling due to the extreme weather. But what a weekend!!! The sun literally came out as we caught our first sight of the lighthouse. Pure magic. The house is amazing, comfortable and warm. Suitable for a romantic hideaway or for a family holiday. We were sorry to leave so soon but will be back. We continue our mission to stay in all the landmark properties. Thank you for the feebcak ,hope you come back soon :). One of the most beautiful and excellent places we ever had in our travel life. The staff greeted us at the property, showed us how everything worked and had lit the fire, which was much needed on a cold November night. The property was equipped with everything we could need and was in good order. The furnishings were not the smartest but provided a cozy and comfortable setting. The surrounding scenery was stunning and there were a number of varied walks nearby. We thoroughly enjoyed our stay and would certainly return. Thank you for taking the time to give us this feedback. I'm glad you enjoyed your stay at Galley and hope you will return soon! Stayed in Galley Head 1 + 2 over New Year's 2013/14. Lovely spacious houses. Since we were occupying both houses it was great to have an interconnecting door. We used the sitting room in House 2 and the kitchen in House 1 as they were the largest. But the views from the kitchen in House 2 are amazing! The houses were cosy with open fires and high comfortable beds. We used lots of self-catering accommodation in Ireland over the years and this was definitely the best. The heating was excellent - the house was almost too warm at times - and it was refreshing to have all utilities included in the price rather than the usual tedious meter reading on the last day. Gerry who looks after House 2 was extremely friendly and, having lived in the house himself, was a great source of information. We even ended up buying his book in Clonakilty! Gail who looks after House 1 was very accommodating and easy to deal with. Neither of the upstairs bathrooms had doors that locked. In House 1 the door opened even with the bolt closed and in House 2 there was no bolt at all. This wasn't an issue for us but it could be easily fixed. Also the water pressure in the upstairs bathroom in House 2 was weak, really just a trickle - brushing teeth was a struggle and taking a shower was out of the question. Luckily the shower in the downstairs bathroom was excellent - and the door locked - so again, this didn't cause any major problems for us. The electricity in the twin room in House 1 didn't work. On the whole though an extremely enjoyable stay in a great location. Thank for your comment. We are really delighted that you enjoyed your stay in Galley Head. We take into account your remarks concerning the problems you met, that is very helpful for us. Kind regards.